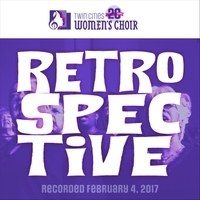 All music was recorded live from: Retrospective, the official 20th Anniversary Concert, on February 4, 2017 at The O'Shaughnessy in Saint Paul, MN. Founded in 1997, the Twin Cities Women's Choir is a diverse community that sings, performs, and affirms the voices of women. As a non-auditioned group, TCWC enables women from a wide range of vocal abilities and musical backgrounds to experience the joy of choral performance. Our vision is to strengthen and inspire individuals and communities through song.